UUM was established on 16 February 1984 under the Universiti Utara Malaysia 1984 Order (Statutory). The primary objective for the setting up of this unique sixth public university has till this day been to train and produce the much needed pool of professionals in the areas of business and management for the local and international markets. The University was corporatised on 23 April 1998. The Universiti Utara Malaysia (UUM) campus is situated in Sintok, 48 km to the north of Alor Setar and 10 km to the east of Changlun, a small town situated along the North-South Highway. The 1,061 hectare campus, which was originally a tin mining area, is surrounded by beautiful scenery, lush tropical forests and undulating hills. In addition, two rivers flow through the campus – the Sintok and Badak rivers – creating a most pleasant and serene environment. UUM has one of the most beautiful and modern campuses in the northern region. 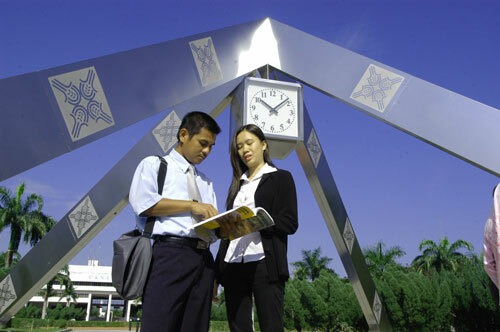 The RM580 million campus started its operations on 15 September 1990 and was officially declaredopen by His Royal Highness the Royal Chancellor of UUM on 17 February 2004. The main buildings in the campus include the academic buildings, the Sultanah Bahiyah Library, the Administration buildings, the Chancellery, the Sultan Badlishah Mosque, the Mu’adzam Shah Hall, the Tan Sri Othman Hall, the Sports Complex, the University Mall, the Student Residential Halls, the Executive Development Centre, and the University Inn. In January 2008, UUM witnessed a major and historic restructuring exercise. A total of 13 faculties were streamlined and restructured to become three main colleges, namely the UUM College of Arts and Sciences (UUM CAS), the UUM College of Business (UUM COB), and the UUM College of Law, Government and International Studies (UUM COLGIS). UUM will have the combined synergistic strength of 550 lecturers in Arts and Sciences; 500 lecturers in the field of Business; 120 academics in Law, Government and International Studies. With the new administrative structure each college now has more autonomy over its decisions and policies. The consolidation of human capital and physical resources inter alia is aimed at providing a strong organizational structure with which to increase the number of postgraduate students, and thrust UUM into the global arena as a major player in tertiary education. We subscribe to the basic philosophy that universities should be universal in scope, and champion the belief that knowledge transcends national boundaries. Simply, the many students who have made us the First Choice University – our students over the years! They bear the best testimonies anyone could ever ask for. “With the fresh air and serene atmosphere in UUM, anyone would naturally feel at peace with oneself and comfortably ease into the world of academic studies” seems to be a common response we get, whether they are local or international students. They were charmed by the magnificent green surroundings of a campus in harmony with Mother Nature, and yet having all the necessary amenities that one might expect from a modern and wellendowed university. Truly we are the University nestled in the palms of Mother Nature. Law, Public Management, Public Administration, Sociology, International Studies Our programmes are recognised by the Ministry of Higher Education Malaysia, and are also accredited by professional bodies such as the Malaysian Institute of Accounting (MIA), National Institute of Accounting (NIA), ACCA, CPA (Australia), CIMA, ICMA (Australia), the Financial Planning Association of Malaysia, and the Legal Profession Qualifying Board (LPQB) Malaysia. The computer laboratories are used for teaching, learning and research. More than 5,000 PCs are made available for student use and these computers are all linked to the Integrated Sintok Local Area Network (ISLAN). The availability of numerous wireless hotspots throughout the campus is another aspect of the fast-paced ICT development which UUM has embraced. All registered students of UUM are accorded the privilege of owning a personal email account. The Sultanah Bahiyah Library is a fully automated library as it has in place an integrated library system known as LINTAS (Library Information Technology Automated System). The library has 1,042,871 items in its collections, including 292,538 volumes of printed materials, 654,139 items of non-printed materials and 96,194 items in electronic / digitised form. The library currently subscribes to 29,262 titles from prestigious electronic journals and 42,000 titles from electronic books. Online collections and services have helped to facilitate and promote the use of information by its clients. The online collection is also made available to registered members via the internet, anytime, anywhere. UUM provides accommodation for almost 22,000 of its students in 15 residential halls; which includes a residential hall for married students. Many of these halls are named after multinational companies. The student residential halls are MAS, TENAGA NASIONAL, TRADEWINDS, PROTON, PETRONAS, EON, SIME DARBY, MISC, TM, PERWAJA, MAYBANK, BANK MUAMALAT, YAYASAN ALBUKHARY, BANK RAKYAT and SME BANK. Each residential hall has its own facilities for students. There are common rooms, a cafeteria, laundry facilities, shops, recreation and sports facilities. UUM is a self-contained campus. As such all the students’ basic needs are catered to in the campus. Most of the modern-day facilities are located centrally at the Varsity Mall. These facilities include banking facilities (BSN, and BIMB), a local Post Office, a Cooperative Bookshop, and a restaurant, which can accommodate up to 350 people at a time. The Mall also has a mini market that supplies stationery, toiletries, groceries and other goods at affordable prices. Located within the Mall premises are 40 shop-lots with a variety of businesses ranging from cyber-centres, hair salons, computer and telecommunication sales and service shops to photocopy service centres. The Varsity Mall is the hub which houses all the basic amenities. The University Health Centre provides a comprehensive health service that covers medical and dental treatment, counselling, first aid, surgery, and medication for students and staff. Other facilities include a computerised haematology laboratory, an imaging and diagnostic laboratory, and also paediatric and ante-natal clinical services. Students can obtain medical treatment from a public or state hospital for a nominal charge. However, international students are advised to obtain comprehensive health insurance coverage. The university provides several facilities for sports and recreational activities for all students and staff as part of the objective to develop a physically and mentally healthy community. In its quest to develop well-rounded individuals, the University has an extensive array of sports and recreational facilities, which include an Olympicsize swimming pool, a mini-stadium with state-of-theart running track, an archery range, badminton, tennis, basketball, volleyball, rugby, hockey, softball, handball and netball courts as well as football fields. UUM is the only university in Malaysia that has a go-kart circuit and an equestrian centre as well as an impressive 9-hole golf course. The University also provides recreational facilities for canoeing, jogging, cycling, jungle trekking, climbing, abseiling and camping. The latest pride of the University is the Tunku Intan Safinaz Shooting Range. This 23-acre shooting range which costs RM1.6 million is a great boost to the University’s efforts to provide the best facilities to further promote sporting excellence in the country. Once you think about countries in the south of East Asia, your thinking will go directly to one of the most wonderful countries in the world, which is Malaysia. When I was in Yemen (my country), they gave to me choices to complete my studies in any of Asian countries. I preferred to choose Malaysia, just for its reputation in my country as developed and beautiful country. When I reach Kuala Lumpur (the capital of Malaysia), it is very interesting and fabulous. People here in Malaysia are helpful, quiet, and very kind. Currently I study in Universiti Utara Malaysia and I bring my family as I find Malaysia is safe country. I have been here for more than one year and half, my family and I enjoy here. I chose UUM for my studies because of its strategic location, fantastic facilities and friendly staff. Studying at UUM not only give me opportunity to learn more, but also to enhance my international exposure and experience in the multi-variant of Malaysian culture. I am in my second semester of my MBA (Accounting) programme. I came to Malaysia because I heard so many good things about this country. Further, it is an Islamic country, developed and well known among the Arabs. The Malaysian Embassy in Yemen has been very helpful, effective and efficient in providing information about higher education in this country. Moreover, the embassy recommended me to further my studies in Malaysia. Hello! My name is Pham Hong Long. I am from VietnamNationalUniversity, Hanoi. Now I am doing Master of Science (Tourism Management) in UUM. Why do I choose to study in Malaysia and in UUM? Simply, I like the studying environment in Malaysia in general and UUM in particular. I can integrate into the Malaysia’s culture and societies easily because we are in the same region - the South East Asia. The people here are very helpful, they are warmly and friendly. The lecturers are very good. The library, the computer labs, and other public services are very convenience. More over, in UUM I have the chances to meet and communicate with not only Malaysian, Chinese, and Indian Students but also with other foreign students. it is good for me to discover a lot of cultures. If I have the chance, I will come back to study PhD in Malaysia. Four years being a student of UUM has taught me English very well. I think that the lecturers are professional and very talented. They are ready to give and listen to ideas and feedback from students. The most important thing that I discovered in UUM is the modern and numerous facilities for students. I am able to make new friends among the mix of people from different backgrounds. Their unique cultures make me learn more about them, besides just learning my subjects. I am really proud to be studying in Universiti Utara Malaysia. In addition to the high quality education and world-class facilities, studying in UUM equips me with knowledge and I strongly believe that this place is perfect and professional in many ways. This is the only Islamic country where you can find all the many races, Malay, Chinese, and Indian living in harmony together.